As a PHP RAD (Rapid Application Development) tool, Scriptcase will help you to reduce the form creation time up to 80%, it will allow you to have a full function, secure and complete form with just a few clicks. Scriptcase will read your database, understand the fields’ type, relationships, dependencies, keys, tables’ structures and special characteristics to create a form based on it. You can make changes on Scriptcase’s form fields that you were not able to do directly in the database for some reason, for example, if you want to set a field to auto increment even if is not set in the database, you can force specific values for update and/or delete, set it as a unique key all using only Scriptcase, without the need of changing anything on the database. Single record: Only one record per page. Single record Form, where we can see the features: copy button, quick search and a field data using a multi-month calendar. This Multiple records Form is using the following features: Rows limit, Page links, New calculator and Spin up/down in integer fields. 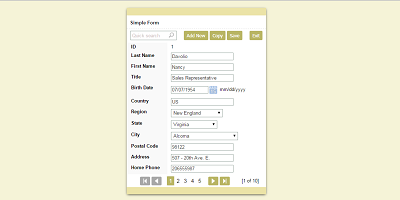 This Editable Grid View Form uses the following features: Quicksearch, Sorting and Counter. In this example a complete master / detail application is developed. Here two forms are created. The first (Master) is based on the orders table and the second (Detail) is based on the orders details. We tried to create a very complete and secure form to left only you worried about the business rules from your form, stop losing time doing the same thing over and over again, purchase Scriptcase today and triplicate your development performance. Previus postInternet 5g coming soon!